A beautifully crafted flared staircase can take a luxury home or commercial space to new levels, adding just a touch of drama. Incorporating a flare is an excellent way to customize a straight staircase or to add some curved lines to an area where a full curved staircase is not a spatial fit. 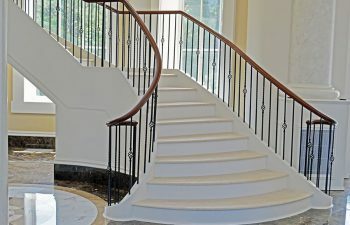 Our innovative and skilled team enjoys working collaboratively with homeowners, builders, designers, and architects to design and construct beautiful flared custom staircases. We embrace the challenge of bringing a unique vision to life, and we are proud to offer limitless options when it comes to style and materials. Our flared stair designs range from contemporary to traditional, and we work with wood, metal, and glass. This week, we highlight several of our custom flared staircase projects. First, a white flared stair brightens this entry space. The clean lines of the simple wrought iron baluster system and the freestanding construction only make this gorgeous stair more unique. 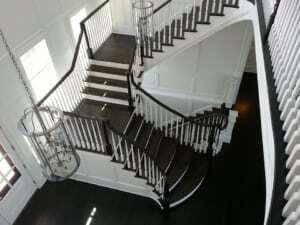 Our second featured flared stair project is a beautiful traditional staircase. The perfect fit for this home’s entry, the stair’s flare catches the eye and makes a sophisticated statement. The dark wood treads and handrail are paired with paint grade risers and balusters for a classic, polished look. Often, flares are incorporated to enhance the aesthetics of a straight staircase. 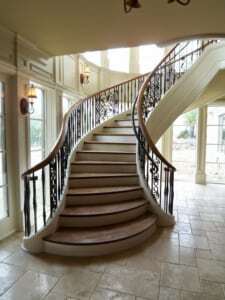 However, as seen in our next project photo, a well-designed flare can perfectly complement a curved staircase as well. This project, featuring a Tuscan-style wrought iron balustrade system and freestanding design, draws the eye upward and exudes a sense of luxury. We are proud to provide our clients with a seamless, cohesive design and flawless fit and finish, and we maintain a commitment to delivering each project on time with the highest quality. View our flared staircase gallery for additional inspiration photos and details regarding our products and offerings. From inspiration to installation our team is committed to designing and building the highest quality custom staircases. Our reputation speaks for itself and client satisfaction is our highest priority. Contact us today to discuss your next custom stairs project.